Finally some geology. 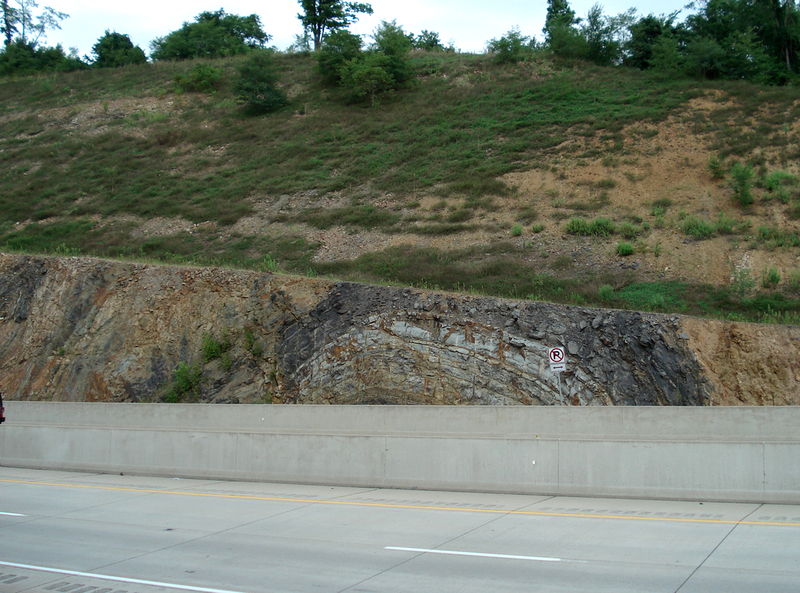 I had been wanted to do a bit about the spectacular geology in Pennsylvania for a while now and finally got around to taking my camera long to take shots of a very nice road cut. Of course, after scrambling up a embankment to get some photos, I find that Google Maps street view has better ones, in large part, than I was able to take with my cheap digital camera. Sigh. 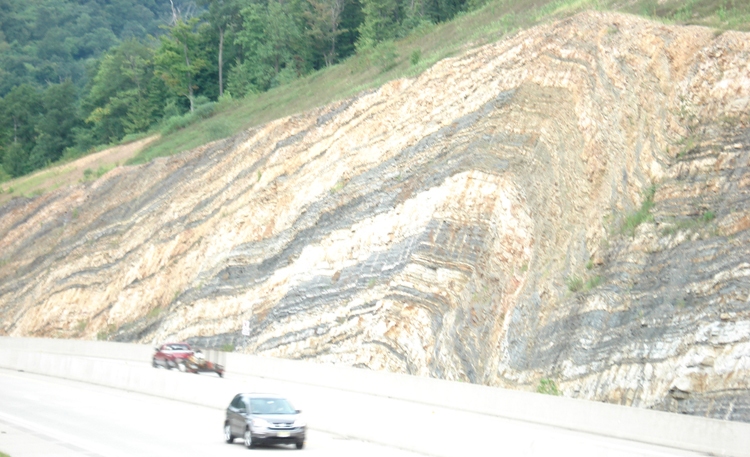 This is along US 322 on the westbound side, just west of the Arch Rock Road exit. (photos were taken from the eastbound side) This was created a few years back when the bottle neck along the Juniata (note, not “Juanita” like the folks on the Weather Channel like to call it) River was opened up with a big road replacement project. Thank you PennDOT, you took a 1/2 hour off my trip time when I go visit my folks. Central PA is along the spine of the Appalachian Mountains, and this particular bit is in the Ridge and Valley province of the mountains. 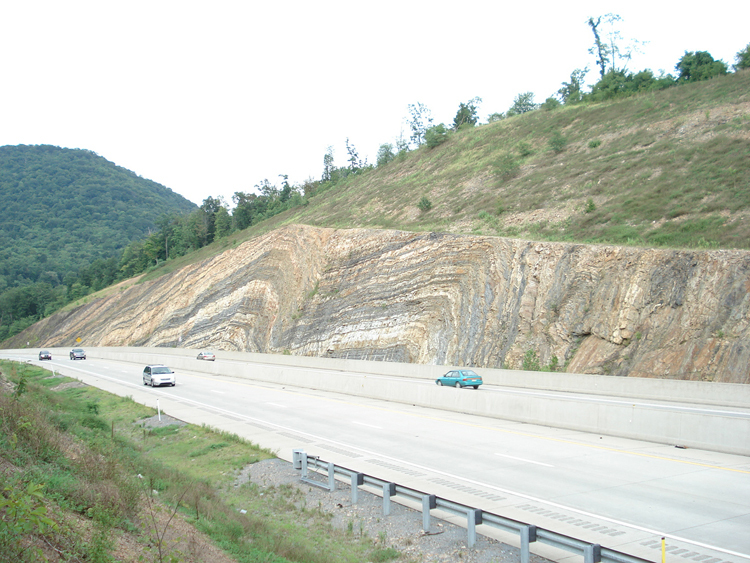 At one point, these mountains were as high as the Rockies, formed during various orogenies (aka mountain building events), the latest one being the Alleghenian/Applachian orogeny. But since physics keeps on working and they were formed a very long time ago, they have eroded down, filling their valleys with sediment. Much of this sediment is interlayered with coal and has natural gas/petroleum (including that Marcellus gas that’s often in the news) thanks to the burying of swamps from ancient river deltas. What you can see here are their roots, the evidence that plate tectonics exists, and the evidence that no ridiculous stories about a magical flood are true. I could do a whole post on what’s wrong with the creationist claims but it’s been done better by others, especially potholer54’s videos: Noah’s Flood Debunked Part 1 and Noah’s Flood Debunked Part 2 . However, if anyone wants their particular questions answered by me, please ask and I’ll do my best. Also, if you can and haven’t already, give money to the Wikipedia Foundation to keep it going. I donate and I link to it a lot. 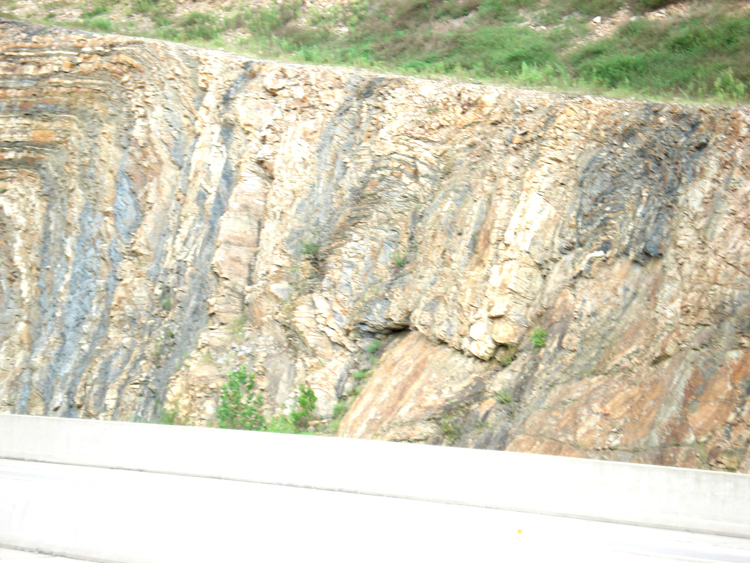 In the images, there are folds, syncline and anticline, as well as ductile folding (folding without breakage) and brittle folding (where it does break). Those aren’t as clear as they could be but very striking if you are right there (or have a better camera than mine…). Here’s the Google Maps street level images. Make sure to look up and down the exposure to see it all. that roadcut is fairly new, probably done in the last five years. Used to be, there was a two lane road through this area, and now it’s a full highway, jersey barriers and all.